Headlines: We have had some excellent reports this week. Some areas had a little more rain last week and the rivers have continued to fish well. Baitfishing has been good. Trolling has been a little hit and miss. But certainly there are plenty of options in the area at present. We have had reports of excellent numbers of Rainbows in the lower Eucumbene which have been biting readily and although some are a little small still provide a ton of fun. Some anglers, however, reported not even seeing a fish above Providence. There is still plenty of river between Anglers Reach and Providence and this appears to be the best area. Any decent rain should push more fish in over the next few weeks too. One report had two anglers hook eighty fish between them in the lower Eucumbene. Not all of these were landed and all that made it to the bank were released. The Thredbo has great numbers also and perhaps a slightly better class of fish and bigger numbers. There have been many anglers trying and the key is definitely to get the fly down using either a heavily weighted fly or adding weight to your leader. Standard rig is an indicator with a Globug/Nymph fished underneath. We have had several reports of fish taking dry flies so a search with an attractor type dry fly pattern during the day should work well. The Murrumbidgee, Moonbah, Gungarlin, are all worth a look. The Eastern Monaro streams have had good rain in the early winter and few fish have been reported. George Lincoln and I had two days of fishing the Eucumbene River this week. Our first stop on Tuesday was Suicide Hole.You warned that there were few fish this far up the river, which proved correct as both George and I blanked. After lunch we moved to the lower reaches where we had quite a few hook ups. In my case a ½ lb brown and two rainbows, one ¾ lb and the other 1lb. George and I stayed in a cabin on Tuesday night, not far from the Eucumbene River, and Wednesday morning saw us on the water before 0730 am. We had an excellent day of fishing. In my case I landed 12 rainbows: two ½ pounders, a ¾ pounder, eight 1 pounders and a 1 ½ pound fish (This was the most fish I have caught in a single day - a real red letter day). The successful flies were: a # 14 Eat Me Nymph (an NZ fly which featured in the UK Fly Fishing and Fly Tying Magazine), a # 16 Pink Jelly Caddis (which was written up in the current edition of FlyLife), and Barry Perkins #18 Glister Nymph  which I might add accounted for the majority of the fish I landed and was the pattern I caught the maojority of fish with while in NZ this year. George and I called it quits at lunch time, as we were pretty well knocked up, and head home very contented fly fishermen. Lake Eucumbene:- Fly reports from Eucumbene suggest not a lot of change but the fishing has continued to improve, and while not all the fish are huge there have been some better Browns lurking around. Best areas to look are Old Adaminaby, Yens Bay, Seven Gates and the Dam wall. Lake Jindabyne:- Fishing has been a little more challenging in Jindabyne this week. Evening fishing has been the best method though not all have been catching fish. Warming water has had a few insects hatching on dark too so you will find fish in close of an evening. Midges and a few Caddis have been on the move on dark and fish have been taking them too. Fishing with a Midge pupa pattern is usually the best option for taking a few fish as is an Elk Hair Caddis retreived slowly across the top. Rocky shorelines have produced for those polaroiding. Some very good Rainbows are in these areas and there have been some big Browns spotted also. Larger streamers arethe go here trying to imitate a large yabby or goldfish. 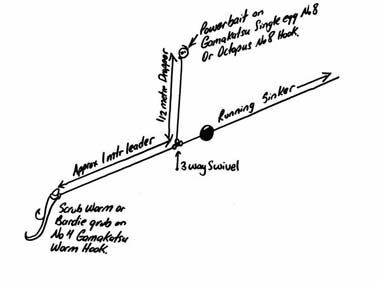 A slow sinking line is good for searching with these patterns. Other areas to look at in Jindabyne are Sid's Bay, Rushes Bay, Kalkite, Creel Bay and Hatchery Bay. Lake Tantangara :- There have been good numbers of fish on the chew in Tantangara and most of these have been surface feeders. A must look at spot after you fish the rivers in the morning. Eucumbene:- With the rising water launching will become progressively easier. The banks are hard so the only thing to be careful of is that there is enough water under the motor when launching. For larger boats Old Adaminaby's ramp is still the best option and as the depth increases will make for less head aches. A 4WD can still be an advantage with the larger boats. Trolling has been at its best late and early in the day. Most of the reports suggest flat lining in close is the best option. Tassies, Lofty's, and Alpine Cobra's are great for this work. The little RMG Scorpion is another great lure for trolling in close as is the Rapala F5. With a mixture of these lures trolling becomes a deadly occupation, deadly for the trout that is. Best colours continue to be the yellow wing models inTassie styles. For the others Rainbow trout, Brown trout and the Holographic golds in the Scorpion are dynamite. Y48 Tassies have also caught a few good fish this weekend. Jindabyne:- With the rising levels the weed beds are the place to troll. Being in close is the key as is an early start. If you really want to catch a fish being on the water as the light starts to improve is essential. If you hit the water at eight o'clock you have missed the peak bite time. Sleep and breakfast? have that later! As with Eucumbene, Tassies and shallow running minnows are the go in close. small Rebel Crickhoppers work well here too. *Blake Carlston from Sydney caught a very nice 3.5kg Brown on a #48 Tassie Devil on the weekend. Baitfishing :- Bait fishing has been absolutely outstanding in Eucumbene with good Browns and Rainbows coming in from the Old Adaminaby area. Powerbait and Scrubworms have been the best baits. Stimulate has been an excellent addition to Scrubworms and those anglers using it have reported a jump in their catch rates. Mudeyes have started to work and with the warming conditions will really come on aover the next few weeks. Darcy O'shannassy with his catch from the weekend. Just a note to let you know how the young bloke went a the weekend. Only managed to put in a couple of hours on Saturday arvo at Anglers Reach. Darcy managed to get 6 fish all on rainbow powerbait. Keeping 5 and releasing 1. 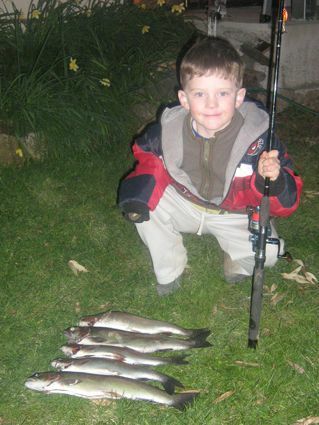 *Simon from Vic had a good session catching five Rainbows and four Browns. Best fish was a 2kg Brown. Gulp Powerbait in rainbow took the Rainbows while worms took the Browns.